Below are a sampling of restaurants that are located throughout the Nanticoke watershed, displayed by the county in which they are located. We hope that this list is helpful to you in planning your travels along the river! Cafe Milano – Welcome to Cafe Milano Federalsburg! We offer the best money can buy, by using the best ingredients. A place where everything is made to order. Federalsburg Family Restaurant – This recently renovated Modern American restaurant serves everything from soups and salads to subs and delicious entrees. – Conveniently located on S. Main St, they serve great Chinese food to the Federalsburg area at a low price. – La Delizia serves pizza, pasta, and subs of a great quality at an affordable price. Their casual atmosphere is very inviting and the staff are welcoming. For more information on dining in Caroline County, please visit the Tour Caroline County website. Bay Country Bakery – We offer and extensive selection of coffee and espresso drinks, as well as delicious bakery items! Bistro Poplar – Serving traditional French cuisine in the heart of historic Cambridge, Maryland. This one-of-a-kind restaurant’s culinary inspiration comes from the Picardy region of France, infused with local flavors such as crab and oyster. Blue Point Provision Company – Featuring a display grill with the best provisions from the Chesapeake Bay, Blue Point offers famous and locally harvested seafood. Located at the Hyatt Regency Chesapeake Bay Resort, Blue Point offers such regional seafood specialties as local bay rockfish, world famous harvested Blue Point oysters, and their own signature crab cakes. Canvasback Restaurant and Irish Pub – The menu encompasses regional, French, Italian, and Irish dishes, with a focus wherever possible on using fresh, organic ingredients. Includes the casual Coolahan’s Pub, with live music most Saturday evenings. Open 7 days a week for lunch and dinner. Carmela’s Cucina – A taste of Italy in the heart of the Chesapeake! This casual, family-owned Italian restaurant is located in Cambridge and features hand-tossed, thin crust, Sicilian style pizza. Specializing in Italian entrees, baked pasta, and seafood pasta dishes, they also serve fresh salads made with local produce, steaks and burgers, and cold and hot subs. – Open for lunch and dinner, Don Chuy specializes in Mexican tacos and burritos made with fresh ingredients and traditional recipes. In downtown Cambridge. Serving beer, wine, and margaritas. High Spot Gastropub – Serving classic pub fare with an emphasis on fresh and local ingredients. Think buffalo oysters, build-your-own burgers, bison tacos, crab cakes, and more. Kids’ menu. Open daily for breakfast, lunch, and dinner. In downtown Cambridge. Hot Spot Cool Eats – Gourmet Hot Dog menu – 10 + types & many variations. Real soft serve ice cream, cones, shakes, sundaes. “Beachin” handcut board-walk style french fries. Fresh baked soft pretzels. Local food products & art featuring numerous Shore Gourmet items. – Casual waterfront dining with a varied menu including salads, chargrilled hamburgers and steaks, homemade soups and desserts, hand-cut fries, and seasonal seafood specialties. – Casual friendly dining. Eat in or take out. Jeanne Cakes – At Jeanne Cakes, Jeanne, a self-taught cake decorator, sells delicious cakes, cake pops, cupcakes, cookies, brownies, and other baked goods. You can place an order for a special event, such as an upcoming family reunion or birthday, or you can stop by the store to see what she has available for sale. Jeanne has been decorating cakes for over 22 years. Leaky Pete’s Oyster and Wine Bar – Casual and fun oyster and wine bar in the heart of Historic Downtown Cambridge. Serving homemade soups, panini style sandwiches, raw oysters, steamed shrimp, mussels and clams. Six brews on draft, IPA’s and $2 Bud Lite draft all day. Millie’s Roadhouse Bar and Grill – Millie’s Roadhouse Bar and Grill serves breakfast, lunch and dinner in Vienna. Offering crab cakes, steamed shrimp, fresh local fish, fresh oysters, steaks, subs, and more. Also available for on-site and off-site catering. Ocean Odyssey – Established in 1986 Ocean Odyssey serves 100% domestic crab meat and local oysters. Dine in or carry out steamed crabs. Also features a rotating stock of fresh fish, craft brews, local wines and fresh bread. – Enjoy unforgettable cuisine as you dine at historic Old Salty’s Restaurant on Hooper Island. Palm Beach Willie’s Fine Food and Spirits – Enjoy floating waterfront dining at Slaughter Creek Marina near Taylors Island. Come by boat or by land! Portside Restaurant – The locals have a special place where they like to go and enjoy a great view, atmosphere, and awesome food. Where is this secret location you might ask? Well of course it’s right here at Portside! Snappers Waterfront Cafe – You are sure to enjoy dining at Snappers Waterfront Cafe, an American Grill and Cantina! We serve the best in Maryland Seafood, Authentic Southwestern Cooking, and American and Island cuisine! Stoked – Wood-fired eatery in downtown Cambridge. Stoked features wood-fired artisanal pizza, 15 kinds of wings, selections of cheeses and charcuterie, sandwiches, and pasta dishes. Stoked also offers craft beers and specialty cocktails. Suicide Bridge Restaurant – Enjoy beautiful waterfront dining in our 450 seat restaurant. Suicide Bridge Restaurant specializes in fresh seafood and prime cuts of beef. We feature award winning crabcakes and homemade desserts. – Family restaurant with affordable fare including pizza, pasta, wings, subs, seafood, and salads. Open daily for breakfast, lunch, and dinner. Eat in, carry out, or call for delivery. For more information about dining in Dorchester County, please visit the Tour Dorchester County website or check out their restaurant guide. Adam’s Ribs – The best ribs and steaks in town! Back Street Grill – We are a fair priced, casual restaurant with exceptional service. Bay Country Meals – Enjoy our wonderful English’s fried chicken! 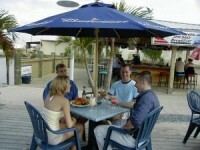 Boonies Restaurant & Bar – Casual dining – delicious steaks, ribs, chicken, seafood, salads and full bar. Brew River – Salisbury’s freshest seafood, waterfront dining and dock bar. Open for breakfast on Sunday. Cactus Taverna – Specializing in Mediterranean, steak & seafood. Goin’ Nuts Café – Homemade and creative, small bar & lounge with outside patio and 2 dining rooms. Locally owned and operated. Hunan Palace – Americanized Chinese food with fresh sushi. Market Street Inn – Casually upscale restaurant on the river. Serves lunch, dinner & outside mojito bar. We also offer catering. Mister Paul’s Legacy – Fresh Seafood! We are known for our Cream of Crab soup and Prime Rib. Locally owned and family operated. MoJo’s – Local urban eatery. Public House – Evolution craft beers paired with exciting gastro pub cooking. 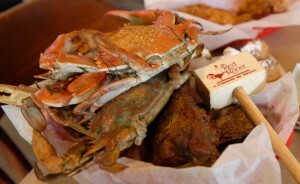 The Red Roost – The Red Roost is the Eastern Shore’s original All You Can Eat Crabhouse. This casual restaurant is equipped for parties of any size. Aside from its All You Can Eat specials, the restaurant boasts a full entrée menu, specializing in seafood, fried chicken and smoked ribs. The Red Roost is closed during the winter season. Restaurant 213 – Fine American dining with global influences. SoBo’s Wine Beerstro – The food is contemporary American cuisine with a bit of an upscale flare, with lunch and dinner menus that change frequently to reflect the flavors of the seasons as well as the wants and needs of our guests. Specific Gravity Pizzeria and Bottle Shop – Featuring an extensive range of craft brewed beers by the pint – the only thing that is better is the handmade pizza. Serving both lunch and dinner in a cool no fuss type atmosphere with a newly added bottle shop featuring a large selection of wines, liquors and of course our own Evolution Craft Beers. Come in for some great pizza and wings then leave with a great bottle of wine as a nightcap from our Bottle Shop. Steak Salisbury – Offering happy hour and daily specials! Abbots on Broad Creek – We are doing lunch, dinner, happy hour and live music at the bar. Kick back and have a drink or a meal on our beautiful outdoor patio or grab dinner in our cozy dining room. We also offer plenty of private dining and local Delaware catering services. If you need an event catered, you’ve come to the right place! Proudly sourcing local products and serving Lunch and Dinner 7 days a week as well as Sunday Brunch, Private Parties and Catering. Dutch Country Market – With roots in Lancaster, PA, Dutch Country Market has been serving its customers baked goods, fresh rotisserie, Lancaster meats and cheeses, salads, sandwiches, platters and other market fresh treats for over twenty years. Open Thursdays, Fridays and Saturdays. Laurel Pizzeria – Laurel Pizzeria offers many Mediterranean recipes made from scratch, from Italian family secrets to traditional American items. Open 7 days a week for dine in and take out. Pizza King – At Pizza King, we are committed to satisfying our customers with great food and excellent service. The same way we have been doing it for over 34 years. We offer a wide variety of pizza, subs, sandwiches, wraps, salads, homemade soups, desserts and much more. Whatever you’re in the mood for, you can find it here! R&R Grill n Bar – Open late for food and fun. Enjoy your Meal while Listening to the Rhythms of the 60s & 70s. Take a Seat in our 57 Chevy and reminisce amid the Memorabilia of Music & Old School Rides. Bayside Seafood and Produce – Open 7 days a week for eat in or take out. Offering USDA choice hand cut meats, daily lunch specials, fresh seafood, farm fresh produce, and smoked meat. – Chinese food in the center of Laurel, across from Market Street Square Park. Tastee Freez – There’s only one chain in the fast food dessert industry that instills feelings of nostalgia… Tastee Freez. As an American tradition born in 1950, our frozen treats bring back fond memories of cool, creamy soft-serve and an era gone by. Oriental Express – Our main mission is to bring you the freshest ingredients and to bring the food alive in our unique style of Mandarin cooking. – Full service barbeque restaurant. – Chinese food and Japanese sushi. Eat in or take out. – Delicatessen take out and convenience store. Pizza King – We offer a wide variety of pizza, subs, sandwiches, wraps, salads, homemade soups, desserts and much more. Whatever you’re in the mood for, you can find it here! Stargate Diner – Serving breakfast, lunch and dinner, 7 days a week. – Eastern shore home cooking. Texas Roadhouse – At Texas Roadhouse, we take pride in everything we do from hand-cut steaks and fall-off-the-bone ribs, to some pretty sweet margaritas. And we do it all with one goal — to give your family a place to go for great food and good times at a fantastic price. – Eat in Chinese restaurant. Grotto Pizza – Legendary Delawarean pizza. – Italian restaurant, sandwich shop, and pizza place. Davelli’s Bagel Cafe – Davelli’s Bagel Cafe’ is a locally owned and operated cafe’ that offers a unique dining experience with great food and great prices. Bon Appetit Restaurant – Escape from the ordinary to enjoy a quiet evening with a European ambiance and French cuisine. Bon Appétit is the perfect place for a romantic evening, power lunch, or just a get together with friends. – Home style restaurant in downtown Seaford. – Enjoy a varied menu of everything from grilled cheese to prime rib at this old-school diner. Friendly’s Restaurant – Family style restaurant serving signature homemade ice cream. Plaza Tapatia – Authentic Mexican cuisine with prompt, friendly service. Applebee’s – Neighborhood bar and grill with a causal dining atmosphere. – Delicatessen eatery close to the Nanticoke River. Cafe Milano – Authentic Italian food and New York style pizza. – Located next to the Nanticoke River Marina.